Dualit DLR-1 review | What Hi-Fi? 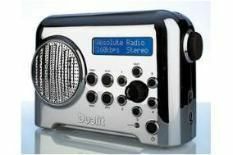 Don't be fooled by the Dualit DLR-1's chrome finish. Unlike its pricier relatives this portable's case is made of plastic, not metal. What the choice of case material doesn't change is the finish's supernatural ability to get covered in finger prints in a matter of minutes. That touch of house-keeping aside there's plenty to like here. The set feels solid and the controls work with precision. General levels of reception with DAB and FM are decent, and along with the usual features the DLR-1 come equipped with an egg timer. Yes, really. Sound is a disappointment, though. Bass is weighty, overly so, sounding ponderous and overbearing, while highs are sharp and edgy. There are better alternatives for this kind of outlay.